Emotional Dance, is almost here and we are glad to share the new tour dates announced in Spain. 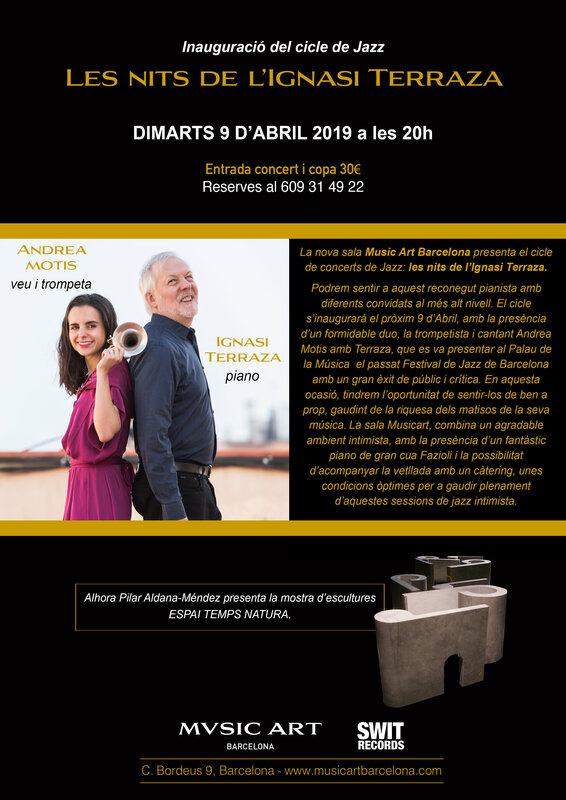 Andrea Motis will be presenting her new album at Cava Urpí (Sabadell) next February 24th, Feb 25 at Teatro Principal in Zaragoza, March 9th at Teatro Nueva Apolo in Madrid; April 6,7 & 8 at Jamboree (Barcelona) and July 11th and 12th in Valencia. Learn more here. To be honest, I discovered your music today by listening to your new album ” Emotional Dance ” and some songs from ” He’s funny that way “. I decided today to follow you and the track you leave behind with your music. Please keep up performing and moving on the good way. I am not a musician, I do not play any instrument. But music is an important part of my life and guides me through my professional practise. Your music is considered by me as an universal language. Life is an emotional dance. I haven’t heard Andrea sing or play anything which was less than marvelous. She’s clearly on her way to greatness. Three suggestions: 1. Get her trumpet playing more out in front. In the first and last choruses, when she sings, she’s the star– in the series of solo spaces, she’s just one of the guys. Her playing deserves more emphasis. Give her two or three more horns under her, and this sequence: arranged ensemble chorus, melody, her on lead; sung chorus; solos; ensemble arranged shout chorus, again her on lead; final sung chorus. 2. She’s an exceptional trumpet player, invariably interesting. But her type of technique doesn’t lend itself to really beautiful ballad playing. A fluegelhorn might make it easier for her to express that intense emotion which she gets from the alto. 3. I hope she’s studying arranging. She’s a very inventive musician, with a fifty-year career ahead of her, and at some point she might want to extend that inventiveness beyond simply the melodic line. And she’s obviously a wonderful person. I hope she can stay above the destructive effects of the music business: that lovely openness is where her music starts. She is a beautiful person first and she makes beautiful music, second. Her knowledge of chord changes is outstanding. My fondness hope is if the Queen of Spain could attend one of her concerts. My second hope is if she could come to New Orleans and bring that fabulous big band with her.